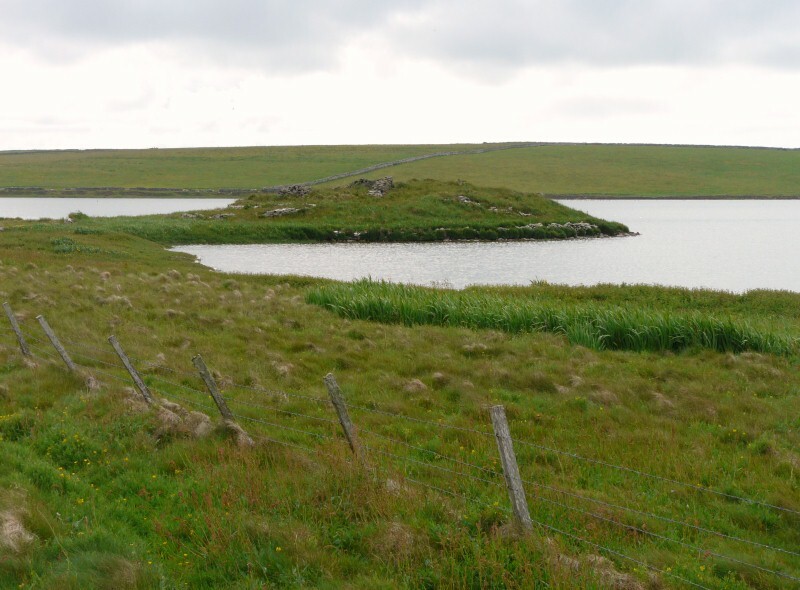 This is a renowned Orkney pilgrimage-centre, standing on a conical mound on a small peninsula (about 4.5 metres high and 35 metres across at the water level) in St Tredwell's Loch. The remains of the late medieval walls can be seen - deliberately built over Iron Age remains, including an underground tunnel leading to a circular building or broch. The thick walls of the chapel and records of tracery work indicate an important and well-founded establishment. The chapel was surveyed by Sir H. Dryden in 1870 when its walls, of variable thickness, were still up to 6 feet high and the interior measured 20ft 3in by 13ft 10ins. the chapel was cleared of rubble by William Traill around 1880. He found thirty copper coins dating between the reigns of Charles II and George III under the chapel floor, along with a female skeleton. "Immediately outside the W wall Traill broke into a subterranean passage which he followed N then NW for some 10m, passing several sets of door-checks and a side-chamber and entering a 'circular building'. Finds from this structure, including a stone ball, are in NMAS (...); others are in Tankerness House Museum (...). The opening into the passage is now blocked by rubble; it is likely that this was part of a complex of late Iron Age buildings, on the wreckage of which the chapel was built. It is possible that that a broch lies at the core of the mound, on the lower SE slope of which a revetment-wall, 1.9m high and traceable for 11m, may be part of an outer wall or ringwork. A few metres to the N of the chapel are the footings of two small subrectangular buildings of indeterminate date. 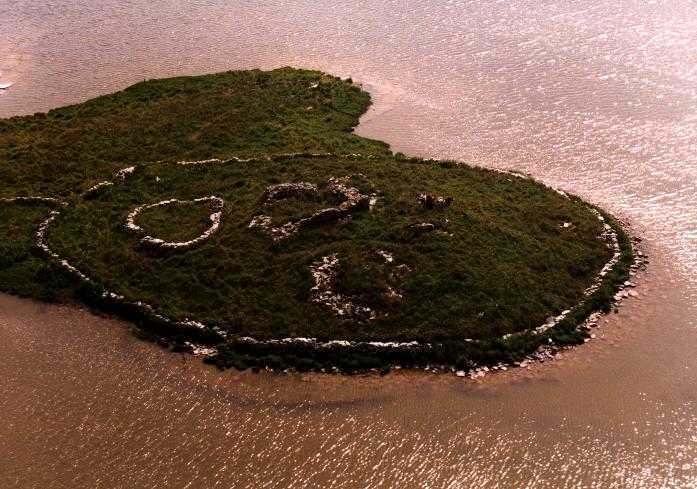 "A cross-slab is said to have been seen some years ago in the deep water besides the islet, but an attempted recovery was unsuccessful"
People used to come to it from other isles; before the chapel door was a heap of small stones, "into which the Superstituous People when they come, do cast a small stone or two for their offering, and some will cast in Money"; the loch is "held by the People as Medicinal"; "a Gentleman in the Countrey, who was much distressed with sore Eyes, went to this Loch and Washing there became sound and whole...with both which persons he who was Minister pf the place for many years was well acquainted and told us that he saw them both before and after the Cure: The present minister of Westra told me that such as are able to walk use to go so many times about the Loch, as they think will perfect the cure before they make any use of the water, and that without speaking to any... not long since, he went to this Loch and found six so making their circuit..." "As for this Loch's appearing like Blood, before any disaster befal the Royal Family, as some do report, we could find no ground to believe any such thing."